"Hey, Ma!" First thing this morning. I can tell from the sound of his voice that everything is OK with the world today. "Go out and pick up the new issue of Time magazine." I shudder. I hate that rag... er, mag. "There's a big picture of my platoon inside." "OK. I'll go pick it up later." "Well, I can't talk now, Ma. I'll call you later. I gotta go [CTI?] [MTI?] [CIT?]. I got all my gear back from Iraq. Hey, you should see my IBA [Interceptor Body Armor]! The vest is just covered in blood, Ma. I mean covered... not a spot of green left on the front." The image flashes through my head of the last time I saw him in the vest the January night he deployed and I remember the green camouflage vividly. I conjure up an image of what it looks like now. I tell him, "Take pictures. You'll want them later. And I'm sure your Dad and brothers will want to see." I know I'm not really wanting to see it. "Love ya, Ma. Gotta go." 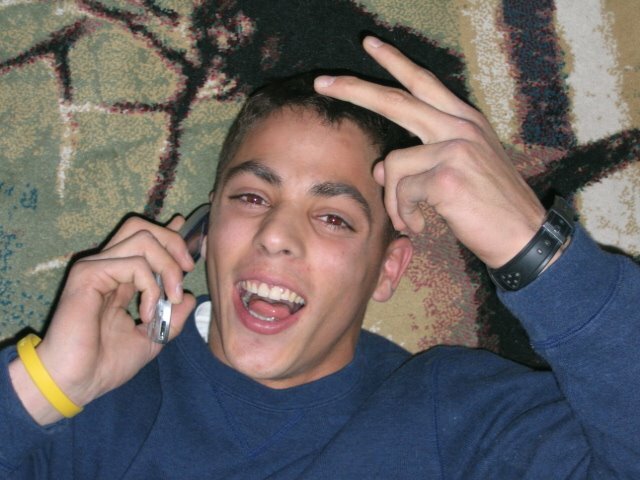 And like a lightning bolt the image of the "sry ma igtg" [Sorry, Ma, I got to go] from a hundred instant messages when he and Our Guys were in Iraq just two months ago flashes across my brain. Then I'm up and out doing errands, including tracking down the Time Magazine. 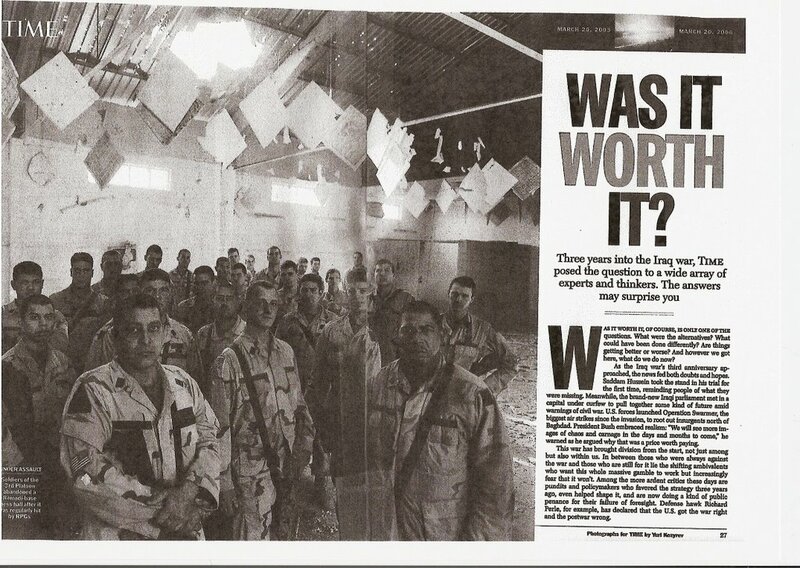 And, sure enough, there in the March 27, 2006 issue on pages 26-27 is a huge picture of 3rd Platoon standing in the mess hall (or rather what's left of it) in ar Ramadi. Of course, Noah's not in the picture; he was already home WIA. It bothers me a little that it's the poster for Time's "Was It Worth It?" story (Dear Time: Did you think to ask any Iraqis whether they thought it was worth it? I digress.) The guys in this picture were the recipients of 18 dozen of Melinda's (Most Certainly Not) world famous chocolate chip cookies this past holiday season. Yes, he has invited someone to the Battalion Ball in April, but she's in college and has to see if she can get away. He has a backup plan, too. He thanked me for sending on the email from the widow of one of his sergeants killed in Iraq who will be at the Welcome Home Ceremony as well as the dedication of the Memorial to the 3ID fallen with her children tomorrow. Yes, of course, he will search her out at the dedication of the Memorial to the Fallen and, yes, he figured there would be a "mom hug" in there somewhere. He has fallen behind on some of his college class work because he hasn't been able to get computer online time, so he's now getting internet access in his room. We discuss his class selections, degree requirements, career paths, and at some point he says, "You know, Mom, I'm probably in this for the long haul." (He means the Army) and I say, "Well, you're 20 now and if you live to 90, you got 70 years ahead of you. Might as well fill it with good stuff." We talk about the upcoming promotion boards, the benefits of being in one platoon over another, how each of Our Guys is doing. I tell him his brother has been selected as Lead Petty Officer on his boat, but when he asks I can't tell him what the Army equivalent is. Yes, he plans to attend his brother's wedding in Virginia in June. He says he also has a wedding in New York in July. He's still waiting to hear if his and a few other soldiers' requests for 4-day passes in May will be approved. They want the passes so that they can attend the wedding in Alaska of one of Matt Bohling's best friends who has invited the guys to come in honor of their mutual friend who was killed in Iraq since Matt won't be there with her. She connected with Noah and Matt's other Army friends via my blog. She emailed me, I emailed the guys. Noah has a block leave (vacation) coming up in the summer and we talk about his desire to spend it in Virginia Beach -- the scene of many happy family vacations in the past and near where his oldest brother is currently stationed. I tell him what a rental house costs for a week and I hear an "Oh." Then we review what it costs to jet ski, deep-sea fish, eat meals... and I hear another, "Oh." But then he mentions that maybe he can stay with his brother or with close friends of the family that live in the area. I suggest a trip out West so we can go riding and shootin' and stuff. We'll see. He says he's contemplating a switch of cell phone companies as the one he has now charges him for every incoming call as well as outgoing and staying in touch just with his Team leaders and the others in his Company is costing him a small fortune. He's considering returning to the company that has a direct connect capability and we talk about one-year contracts versus two years and the approximate cost savings. Update: This was the Sledgehammer Soldier Salute from last night in Columbus, GA which was broadcast and hosted by WTVM. I didn't see Noah anywhere on first watching although he was there somewhere. The 2/69AR is covered at 21:30... and our good friend Lt Joe Walker is at 22:30 of the tape (he's the PLT leader for the guys that got the cookies)... at 32:00 the regimental commanders discuss MSM coverage of the war... at 35:20 when asked to describe their most memorable experiences of the deployment, 2 Lt. Cols. 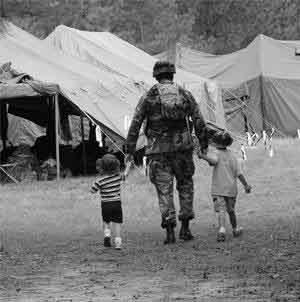 say it was the Iraqi people... at 44:00 on the tape, they cover the 29 dead of the 3 Brigade... the first soldier at 44:10 is Sergeant First Class David Salie, the soldier pictured above with his two youngest children... almost the full minute from 45:07 to 45:57 are the guys from Noah's platoon, including the 5 in his squad that died in the IED explosion in October. The 2-minute blackouts in the video where commercials were in the original broadcast are annoying, but at least you can manipulate the cursor to fast forward. Sounds like a very productive conversation! I'm going to pick u that issue of Time; would love to read the article. Thanks for catching us up with Noah. I am glad that Noah is going to do some volunteering, it will do him loads of good. Sounds like he has lots of plans for the summer. Just hope that he can fit them all in. All I can read from the Time photo you posted is that they talked to a wide array of "experts and thinkers". I'm curious to know who the experts were. Did they also quote our troops (though I realize the media doesn't consider our troops to be experts)? You have good reason to be proud! I'm proud of Noah too. WOW! Noah seems to be thinking about the future in a big way. He sounds really good. Was it worth it? Now there is a question I would like Dan to answer. Along with fighting a war, he had to juggle all the stuff that was going on at home, and is still going on. Was it worth it? Dan had the choice to go to MS and sit until his unit came home from Iraq or go back to Iraq. He chose Iraq. His Dad and I chose MS. but Dan's reasoning was,"I'll be sitting in MS eating pizza and getting fat. I'd rather be in Iraq doing something worth while." YIKES! was my response. I guess I'll never understand, but then I think like a parent and not a soldier. Tell Noah I am so proud of him and his unit. I know it was worth it.